SUBHEAD: If you think that RIMPAC 2014 will be anything but harmful to the environment of Hawaii you are delusional. Image above: Panelists and moderator for Oceans4Peace discussion on RIMPAC, (right to left) Koohan Paik, director of the International Forum on Globalization's Asia-Pacific program; Dr Gordon Labetz moderator; Katherine Muzik PhD, marine biologist; and Juan Wilson, architect and member of the Executive Committee of the Sierra Club Kauai Group. Photo by Jon Letman. The Sierra Club on Kauai is working with a number of other conservation and social justice groups to educate the public about the environmental impacts of the Rim of the Pacific military exercises coming here this month. These RIMPAC war games have occurred biennially for over 40 years, and amount to a ceaseless war against Hawaii and the Pacific Ocean. The US Navy has been damaging the seas and islands throughout the Pacific since making Pearl Harbor its strategic home port. From the end of WWII until 1962 the US exploded over 100 thermonuclear devices in the Pacific Ocean - primarily in the Marshall, and Kiribati islands, but as well as nearby Johnston Atoll. In recent decades several weapon systems have been developed and tested at PMRF here on Kauai. Those systems include submarine based multi-warhead nuclear ballistic missiles capable of ending life on Earth. The PMRF is the wheelhouse for many activities of RIMPAC. And many RIMPAC activities have damaged ocean flora and fauna. Twenty-three nations are tparticipating in this RIMPAC. There will be 43 ships, 200 aircraft, 6 submarines as well as countless bombs, missiles and torpedoes. RIMPAC plans to sink at least three naval ships. Hawaii's reefs, beaches, dunes, valleys, and mountains are RIMPAC targets. In the last 40 years our land has been strewn with defoliants, lead, depleted-uranium munitions and unexploded ordinance. Sunken ships have carried pollutants like bilge remains, hydraulic fluid, PCBs, and other contaminants into the nearby ocean depths. Until August RIMPAC is permitted to kill and maim thousands of fish and marine mammals using high-explosives and brain crushing sonar. Besides the public relation hype and the schmoozing to fund additional military contracts - RIMPAC is a demonstration to the world that America will do anything to maintain military control over the vast Pacific Ocean…. Including killing it. We have more important issues than hypothetical threats to our national security. We face the dire consequences of climate change that will raise the seas and play havoc with our weather. The entire Pacific is increasingly poisoned with radioactive cesium, strontium and plutonium from the Japanese nuclear catastrophe. Our reefs are dying from global warming, acidification and pollution runoffs. And the mega-fauna of the Pacific have been fished to near extinction. We feel the US Navy should set an example to the world. It should focus on healing the wounds to the ocean and its creatures. The nations of RIMPAC should turn to protecting the Pacific Ocean. A good start would be to re-organize RIMPAC into an effort to clean-up and recycle the two monstrous and deadly gyres of trash found to the north and south of Hawaii. In a article on May 23rd in the Garden Island the PMRF Commander Bruce Hay was quoted a saying. No it is not good and it is not cool stuff! Video above: "RIMPACT IMPACT" shown at Oceans4Peace Panel Discussion 6/7/14. From (http://youtu.be/NLZx9fg7Gvg). The 10 minute video above is a brief look back at recent RIMPAC activities. It shows amphibious landings and a new emphasis on urban combat in house-to-house situations. Is this for suppression of civilian populations? RIMPAC seem to be practicing for Littoral Combat. That is - operations near the shore, including support for shore landings and other types of combat shifting from water to ground, and back. If you remember, the Superferry was an experiment to develop a new breed of naval ship capable of reaching shoreline war zones throughout the Pacific in a matter of a few a days. It is notable that one of the ships developed along side the Superferry will join RIMPAC this year for the first time. The littoral combat ships are being developed to improve force maneuverability. They will also provide a platform for the deployment of small unmanned systems in littoral operations. What war in the Pacific is RIMPAC now practicing for? Will it be conducted with drones and robots? We should keep in mind Operation Dominic in 1962 on Johnston Atoll. More than ten thermonuclear devises were detonated around the atoll. Some illuminated night throughout the Hawaiian Islands. This was just 700 miles away off Niihau. The infrastructure for command and control developed to test thermonuclear weapons seems to be the model for use of the PMRF and operate RIMPAC. In fact, as part of Operation Dominic the PMRF oversaw the launch of Frigate Bird, a missile fired from the USS Ethan Allen off our coast that detonated a thermonuclear device over Christmas Island. The PMRF and RIMPAC have been practicing for the end of the world as we know for a long time. Their efforts must be redirected now! "What we have learned from the past is that we are the targets"
PMRF spokesperson Stefan Alford said the Navy has permits from the National Marine Fisheries Service to conduct training and testing activities around Hawaii. In regards to sinking of naval vessels in war games in our waters "for practice" (a practice called SINKEX by RIMPAC folks). "...the vessels have been rigorously cleaned in accordance with federal Environmental Protection Agency requirements,” including the removal of all PCB transformers and large capacitors, all small capacitors to the greatest extent practical, trash, floatable materials, mercury- or fluorocarbon-containing materials and readily detachable solid PCB items." That again is a partial truth. Have you ever tried to empty the oil or gasoline from a car? The navy goes through the motions to meet EPA requirements. When the ships sink they go down with the remnants of what ever munitions and ordinance that sank them. As for depleted uranium - The Navy up until five RIMAPCs ago (1/9/03) had a different position. "The Royal Navy is phasing out depleted uranium ammunition used on some of its warships after the American manufacturers stopped producing the shells over safety concerns, it emerged today. The ammunition is used in the American-designed Phalanx anti-missile system, which is fitted to some of the Navy's destroyers and three other vessels. The US manufacturers have stopped the production line and the American Navy has been phasing out stocks for around a decade, replacing them with tungsten-tipped ammunition, which is not radioactive and far less toxic." "H. R. 5303 To require the suspension of the use, sale, development, production, testing, and export of depleted uranium munitions pending the outcome of certain studies of the health effects of such munitions, and for other purposes." However it seems believe DU was used in Libya in 2011 (http://www.globalresearch.ca/green-light-to-use-of-depleted-uranium-weapons-in-libya/25647) and is still in use by the US Army, Marines and Air Force. Note all these branches participate in RIMPAC live fire exercises. If you think that RIMPAC 2014 will be anything other than harmful to ocean life, and the environment of Hawaii you are delusional. The permits and regulations that the US military must acquiesce to are a burden. But in meeting those requirements RIMPAC is in no way protecting the Pacific Ocean and Hawaii. It merely has an upper limit to the destruction it may reek on us. Kip Goodwin’s guest commentary on June 4 contains several errors. RIMPAC 2014 is a biennial exercise that takes place around the Hawaiian Islands, not just off Kauai. RIMPAC 2014 will involve the sinking of two decommissioned vessels that have been rigorously cleaned in accordance with federal Environmental Protection Agency requirements that include the removal of all PCB transformers and large capacitors, all small capacitors to the greatest extent practical, trash, floatable materials, mercury- or fluorocarbon-containing materials and readily detachable solid PCB items. Petroleum is also cleaned from each vessel’s tanks, piping and reservoirs. Depleted uranium has not been used by the U.S. Navy for RIMPAC or any other activity since it was removed from our inventory years ago. The Navy does have permits from the National Marine Fisheries Service to conduct training and testing activities around Hawaii and other at-sea ranges. A great deal of scientific analysis goes into the environmental impact statements that NMFS requires in order to grant those permits, which allow some “takes” from sonar in Hawaii-Southern California. See www.hstteis.com for details. The vast majority of those “takes” are behavioral responses, where an animal temporarily interrupts its feeding or foraging. No marine mammal mortalities are projected from sonar in RIMPAC 2014 or any of the other naval exercises in Hawaii and Southern California over the next five years. Whenever Navy ships or aircraft use active sonar, they employ protective measures to minimize the potential harm to marine life. Those measures include use of trained lookouts and designated safety zones. Despite what Goodwin and others believe, there is no evidence that sonar from RIMPAC participants has caused the death of any marine mammals since RIMPAC started in 1971. In fact, the science points to other causes. The aggregation of melon-headed whales at Hanalei in 2004? Scientists learned there were similar aggregations of that species on that very day in the Northern Mariana Islands and later in the Philippines in 2009, both far from any naval activity. The Navy is a world leader in funding marine mammal research. The truth is that the Navy goes to great lengths to protect the environment while we fulfill our duty to defend the nation. The Pacific Fleet hosts RIMPAC every two years not to prepare for war, but to preserve the peace, working with our partners, allies and friends on everything from communication and logistical interoperability to war-fighting, if that is required. Incidentally, humanitarian assistance/disaster response is a part of the RIMPAC exercise, because naval forces are often best able to assist after a calamity. After Hurricane Iniki devastated Kauai in September 1992, a Navy ship, USS Belleau Wood, carried the first heavy equipment and large quantities of supplies to the island, and the Pacific Missile Range Facility provided the only operating airfield for Kauai’s Westside, which was cut off for weeks from the rest of the island. RIMPAC 2014 will involve Hawaii-based Department of Defense and local medical facilities in activities that enhance operability, test communication and exercise crisis response capabilities among interagency partners. While we share Goodwin’s hopes for the best, we must be prepared for something less than that. • Stefan Alford is the public affairs officer at the Pacific Missile Range Facility on Kauai’s Westside. Video above: "No Missiles on Kauai!" 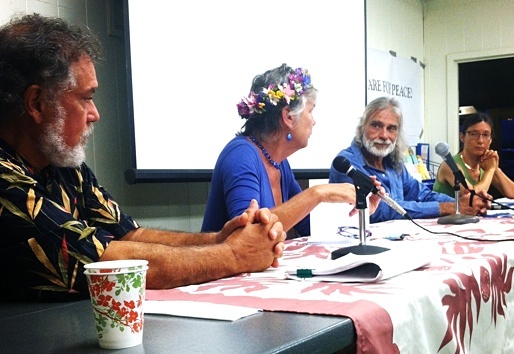 Members of the Kauai Alliance for Peace and Social Justice, including Fred Dente, Kip Goodwin, Katherine Muzik and others, oppose the testing and deployment of missiles from the world's largest missile range: Pacific Missile Range Facility (PMRF), located on the Hawaiian island of Kauai. Film by Koohan Paik. From (http://youtu.be/ahG9Yp0kd5k). Kauai organizations are planning to protest international maritime exercises hosted by the U.S. Navy this summer. A coalition called Oceans 4 Peace says it will educate the public on the dangers of what it calls "permanent war preparation and naval military harm" to oceans. Among its concerns is how sonar affects marine mammals. More than 20 countries are expected to participate in Rim of the Pacific exercises starting June 26. Some of the exercises will take place in waters off Kauai. China will be sending ships to the drills for the first time. The drills are held every other year in Hawaii waters. The activists will kick off a series of public events with a teach-in panel discussion and film in Lihue on Saturday, The Garden Island newspaper (http://bit.ly/1kInCo4) reported. Kip Goodwin of Kauai Alliance for Peace and Justice says preparing for war will only encourage more war. "It is time nations prepare for peace and do training exercises that build bridges instead of walls," he wrote in a release. Kalasara Setaysha, chair of Kohola Leo, said naval sonar harms whale and dolphin hearing, which the marine mammals need to survive. Pacific Missile Range Facility spokesman Stefan Alford said the Navy has permits to conduct training and activities around Hawaii. He said most of the time the only way sonar affects marine mammals is to temporarily disrupt their feeding or foraging. No marine mammals are expected to die as a result of the exercises, he said. The coalition also expressed concerns about the Navy's plans to sink decommissioned vessels, saying they would be left to pollute the ocean floor. Alford says the vessels have been "rigorously cleaned in accordance with federal Environmental Protection Agency requirements." Oceans 4 Peace, which includes the Kauai Sierra Club and People for the Preservation of Kauai, has set up a RIMPAC hotline where people can call in and report strange or dangerous activities that may have been caused by the exercises. • Kip Goodwin is a member of Kauai Alliance for Peace and Social Justice, an organization sponsoring Oceans4Peace.